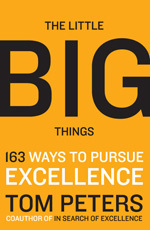 The Little BIG Things is a compendium of 163 ways to pursue excellence—with tips ranging from the blatantly obvious, "Show Up! (It's a Start.)" and "It's All About ... the Quality of the Workforce," to the wildly counterintuitive, "Boring Is Beautiful" and "Reward DNK (Do Not Know)," to the often repeated, "The Customer Is 'She.'" Begun as a repackaging of the Success Tips from our blog, this book became so much more as Tom worked and reworked its contents. Now, its main message is that EXCELLENCE is the result of many small tasks, all of which can be practiced and mastered. You can purchase The Little BIG Things on iTunes as an ebook, an enhanced ebook, or you can find several apps combining video and text from the book. Visit Tom's iTunes page to find them. While Tom was reading The Little BIG Things for the audio edition, we made a collection of mp3 files, one item at a time. So, here they are, The Little BIG Things read by Tom. We've posted them a section at a time, and the book is now complete. Listen and get energized by Tom's enthusiastic rendering of his book! We caught Tom on camera talking about many of the little BIG things included in the book. He talks about the importance of listening in the video below. For more videos in this series, visit our channel at YouTube. Why not read a sample from the book? Choose from the Introduction, the Table of Contents, the section about Others, or the section on Enterprise. As a preview, we had sent section 1, Little, to recipients of our TP Times newsletter, and that's also available. From Tom: "You'll find here the 'CliffsNotes' version of The Little BIG Things. In the interest of getting connected with as many people as possible, I've produced a series of 'Highlights' pdfs, which capture the 'BIG idea' in each of these 'little BIG things.' Missing are (1) the nuances and (2) 90 percent of the 'How to's' and the rationale for those 'How to's.' Eliminating the subtleties and cutting the action part is cutting the heart out of the book—nonetheless, I hope you will be titillated by what follows and moved, perhaps, to purchase the book; or in fact to use this version, distribute it, etc.—I want the ideas to circulate to the max." There are 48 sections and an introduction, each only a page or two, released over the course of several months. #41 Special Section: The Top 50 "Have Yous"